Bold and even bold geometric shapes. Cutting eye asymmetry, uneven sections, a sense of multidimensionality and volume. This art-deco differs substantially from the regular forms prevailing before it and the smooth lines. An abundance of colors, patterns, ornaments, textures. It is the influence of art deco that we owe to the actual and in our time combinations of different patterns in one subject of the interior. In this style, there is a certain ostentation of abundance, but it is not arrogant, but rather generous, wasteful, excessive, as is the abundance of summer colors in the June noon. 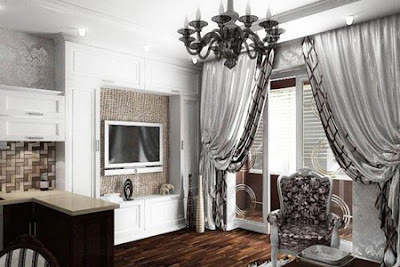 Initially, Art Deco curtains had all the trends of luxurious and even chic style, and this was like a fairy-tale, where all sorts of elements were mixed on the jaded pictures. However, life has made some adjustments, and expensive materials have been replaced by natural ones, instead of crocodile leather, veal has been used, and silver plays a great role in aluminum. Art deco evolved towards functionality and practicality. This style obviously gravitates towards ethnicity. Oriental ornaments, repetitive motifs of tropical plants and animals, golden fabrics woven with oriental patterns - all this is abundantly represented in art deco curtains. 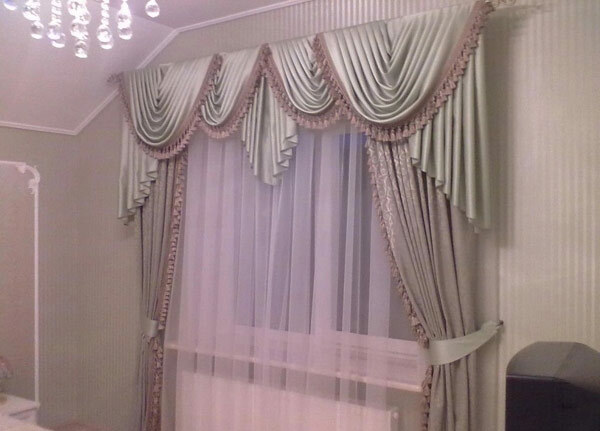 How should the art deco curtains look? Abundant. No shortened version to the window sill, any attachments in the window sash! Waves of tissue should not hang, but literally "fall down". The original. Banal coats with lambrequins do not fit. Art deco curtains should be a special highlight, but rather a few. Multilayered webs of different lengths, asymmetrical folds, unexpected combinations of different textures are suitable for creating the right image. Various. Transfusions of color range, golden and silvery additions, woven patterns, combinations of unthinkable fabric drawings - from abstract spirals to sensual coils of oriental ornaments. This is all typical for Art deco curtains in this style. 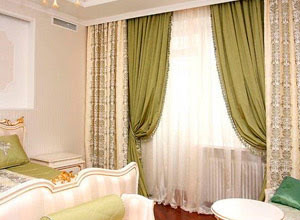 It is quite appropriate to use several fabrics, for example, organza and velvet, silk and taffeta. Lightweight fabrics can act as day curtains, but more dense and heavy ones will be useful to obscure windows in the evening. Functional. 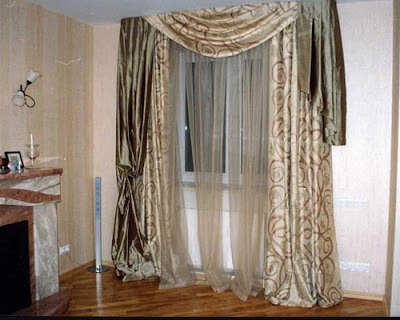 Do not forget that art deco curtains were strongly influenced by Cubism and Constructivism, so for all the ostentatious light-mindedness of this style, it is quite practical. 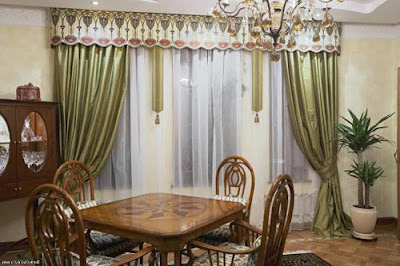 Twisted cords of gold thread control the mechanism of curtains, forged rings precisely calculated for the thickness of the fabric, and the asymmetry of the curtains helps to easily manage the balcony door. 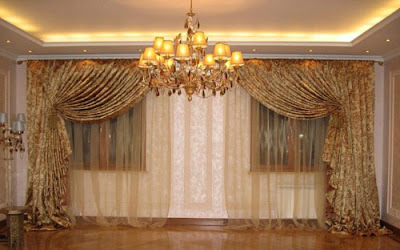 Now there is a strong opinion that these curtains should be made entirely of natural materials. However, the style allows the presence of modern options. So do not give up practical and comfortable fabrics just because they have a small percentage of artificial fiber. Pay attention to the heavy loose fabrics: velvet, velour. They can act as a curtain or complement the composition as separate elements, for example, trimmings or pick-ups. Light, as if flying fabrics, such as taffeta or organza fit well as decorative curtains. Let these fabrics be decorated with bright and unusual drawings: fantastic birds, variations on the theme of tropical fauna and flora, geometric patterns and abstract lines of the most whimsical curves. 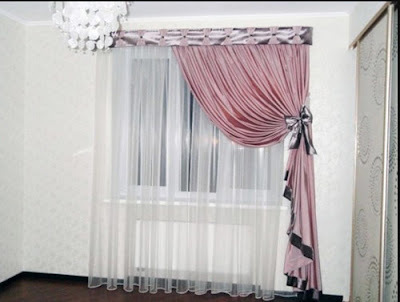 Such decor perfectly fits into the general concept of curtains. Silk of different composition and colors. Silk fabrics, even very beautiful, can look boring for art deco, so they especially need curtains-companions and additional decorative elements: forged cornices, bronze pickings, non-standard finishes. Tapestry fabrics in themselves are very whimsical, and if you choose the options with golden threads and a rich oriental pattern, then the basis for your art deco curtains you just picked up. 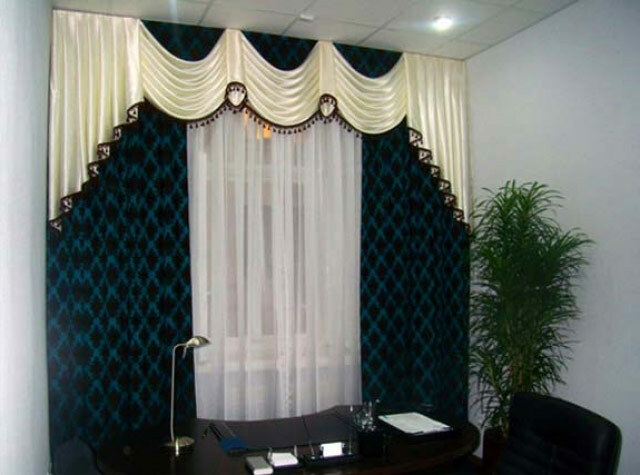 Very actively used in the manufacture of such curtains are various options for quality satin. Its smooth, slightly shiny surface can be decorated with a wide variety of patterns. Perfectly look satin curtains, woven fantastic colors. 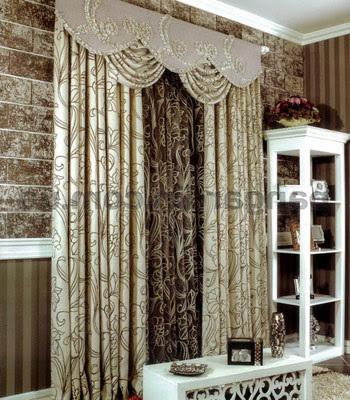 As an additional element can act as curtains-threads, richly decorated cloth panels. 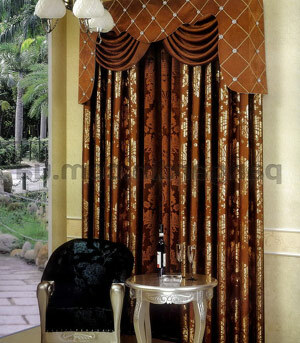 You can supplement the composition with Roman curtains, variations on the theme of Japanese curtains. 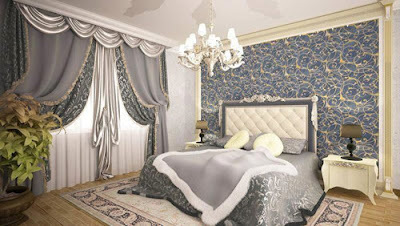 All this will help create an unusual, original image of modern art deco curtains in the style of art deco. In the matter of color selection, there are practically no restrictions for art deco curtains. Unexpected combinations and options are welcome. 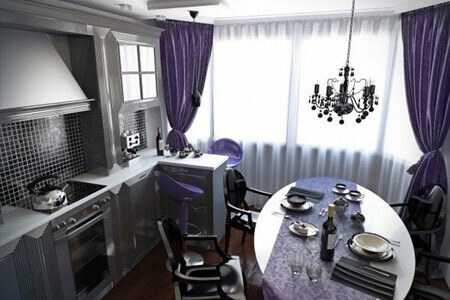 Although their favorite color motifs are also in the art deco style. The combination of black, white and gold colors is luxurious. In this case, it can be, as ornaments, and individual sections and cloths of fabrics. A favorite combination of colors: blue and orange on a brown-chocolate background. If it is an ornament, then its individual elements will be highlighted with a white or golden outline. In the modern version of art deco are actively used coffee and delicate strawberry. 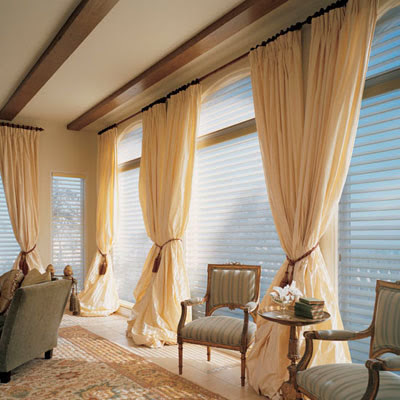 As a supplement, white is often chosen; however, it only weakens the effect, curtains lose expressiveness. It is better to prefer a silvery or pearl color as a "third superfluous". 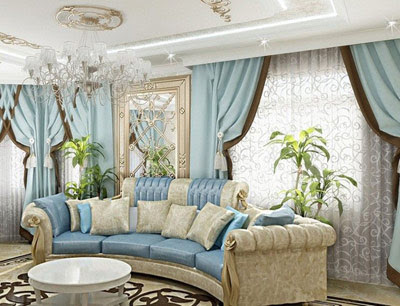 Thick, saturated shades are diluted even more saturated - that's one of the principles of forming a color range of curtains in the style of art deco. Deep raspberry is complemented by coffee, royal blue is emphasized by dense purple and sunny-yellow, scarlet is fixed with coal black and grassy-green, and blue is golden and purple. 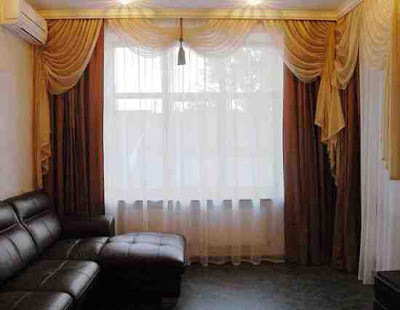 Should I make the whole room in the same style, or can I integrate the art deco curtains into some other interiors? 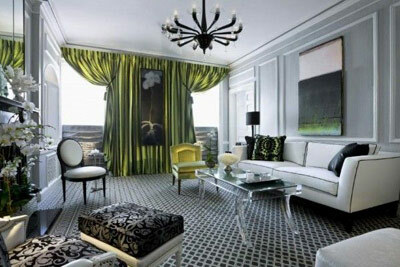 Since the art-deco style itself is eclectic, it willingly adjoins to different variants of design of rooms and premises. In the classical style, such curtains can look very good, especially if the classic gravitates to the frivolity of France, and not to the solidity of England. Interior in the Art Nouveau style is perfectly complemented with art deco curtains. These styles are close relatives so they can be combined safely. 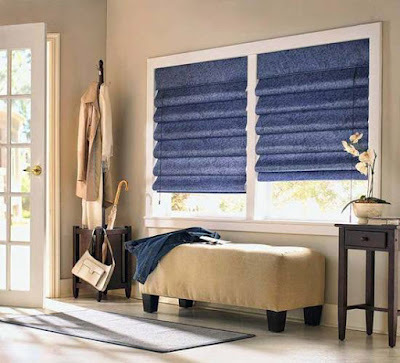 Paradoxical as it sounds, the utilitarian design of constructivism of art deco blinds will only decorate, especially if they are supported by a couple of interior items. Such curtains very well in harmony with ethnicity, especially light, not requiring strict authenticity. 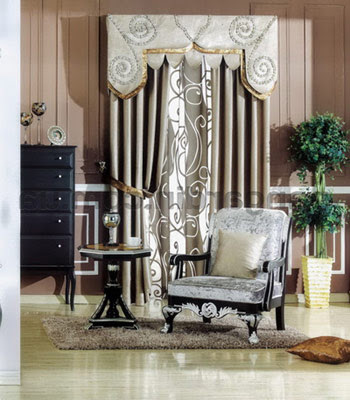 The ornamental motifs of South America and Africa, Southeast Asia and Japan will help curtains in the style of art deco quite naturally look in the most exotic interiors. 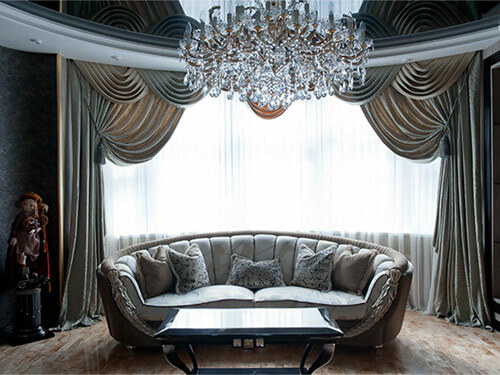 Art deco curtains, despite their redundancy and luxurious beauty, have not lost their appeal for modern, often highly functional interiors. 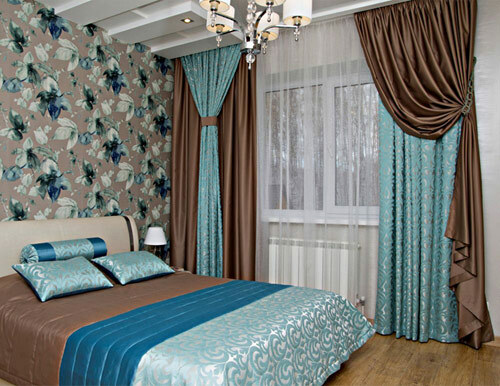 Some frivolity inherent in this style, reckless ease and an abundance of unusual elements, colors and textures give the art deco curtains a unique charm. This direction will not be autonomous. It necessarily exists together as a compliment, the emphasis on a style. Abundant. Fabrics need to beautifully fall. There are no short curtains and fastenings on the window itself! The original. 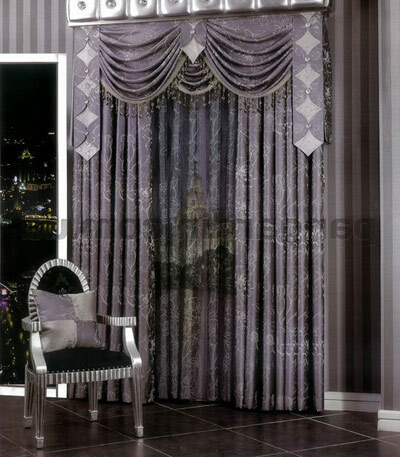 In curtains should be a highlight: asymmetry, unexpected combinations of fabrics. Various. 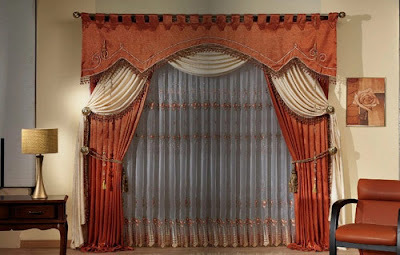 The curtains differ in color, in texture. 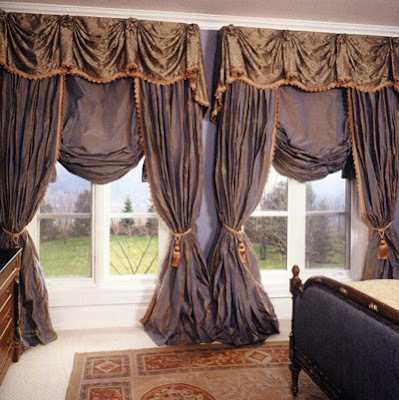 For example, you can combine an easy taffeta, which will be day curtains, with heavy velvet as night curtains. Functional. 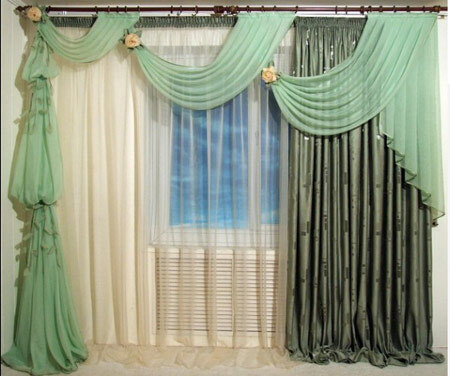 All elements of curtains must carry a practical load. For example, asymmetry helps to manage the balcony door. 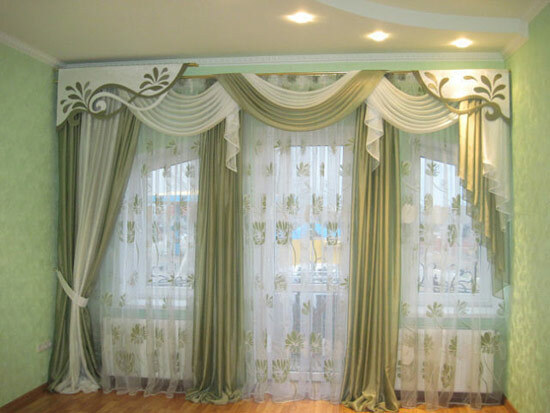 Art deco curtains have its own development trend: then entering into fashion, it is almost completely disappearing.